Ryder System, Inc. (NYSE: R), a leader in commercial fleet management, dedicated transportation, and supply chain solutions, today announced that it has awarded Darek Mowinski the title of 2016 Top Technician, along with a cash prize of $50,000. Mr. Mowinski is the first-ever technician from Ryder Canada to win the competition. The Ryder Top Technician (Top Tech) Recognition Program - designed to identify, recognize, and reward Ryder's top performing truck maintenance technicians - celebrated its 15 th anniversary this year with a "History in the Making" theme, and hosted the competition at the Gaylord National Resort & Convention Center outside of Washington, D.C.
Rick Morra of Hanford, Calif.
All seven technicians received $10,000 each for their exemplary performance. "Ryder has continued to grow and refine this program over the past 15 years, and it's been an honor to witness just how far it's come," said Robert Sanchez, Ryder Chairman and CEO. "We started out with 212 techs competing at the first-ever Top Tech Level I in 2002, to 3,220 techs competing at Level I in 2016. I am immensely proud of the team of people who continue to contribute to making this competition bigger and better each year, and congratulate all of our Top Tech competitors who have invested their time and energy to be the best technicians in the industry." All of the hard work did not come without its rewards. Each finalist and their guest were treated to a week's worth of fun and relaxation - from touring museums and historic D.C. monuments, to getting pampered at the Gaylord's spa. "Our goal this year was to grow Top Tech participation to 3,000, and we far surpassed that, with 3,220 technicians signing up to be a part of this rewarding program," said Dennis Cooke, President of Global Fleet Management Solutions, Ryder. "More and more techs are stepping up to the plate, going outside of their comfort zones, challenging themselves to learn more, and making lasting relationships along the way. We know how hard our technicians work, which is why we strive to make the prize more enticing each year." Ryder's annual Top Technician Recognition Program highlights the value Ryder places on its technicians, the importance of technical training for ensuring quality maintenance for total vehicles maintained of approximately 231,900, and a commitment to quality customer service for Ryder's lease and maintenance customers. 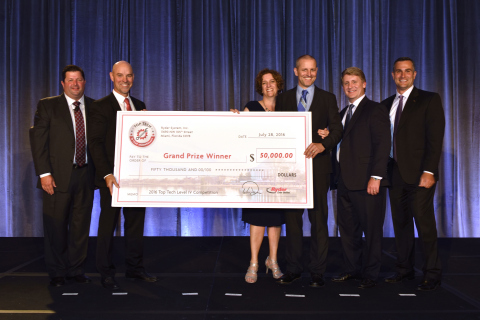 Eligible participants for the award were selected from Ryder's team of more than 5,300 U.S. and Canadian-based technicians and were measured on technical training qualifications, outstanding customer service performance, and quality workmanship. To search for available technician positions in your area, click here. Highlights of the event can be found on Ryder's social media pages: Facebook, Twitter, LinkedIn, and Instagram. For event photos, contact Jennifer Hanlon at Jennifer_A_Hanlon@Ryder.com.